Yet to be convinced about glamping? Book into Trevella Park, near to the glorious beach at Crantock, and the comfy beds, fluffy duvets and fridges that come with the safari tents should help to convince you. The site itself is pleasingly free of ‘entertainment’ and instead offers nature trails, fishing lakes and a heated outdoor pool. Our five star holiday park is perfectly located by Crantock Beach close to Newquay. Not only do we offer well-equipped holiday homes with two and three bedrooms but, we also have a little slice of glamping heaven. 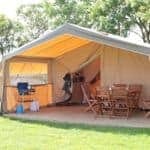 You can stay in safari tents which look out across the rolling Cornish countryside. Each is equipped with comfy beds, duvets, furniture and outside decking and dining facilities too, for food and wine underneath the giant Cornwall skies. They sleep from four to six people. New for 2018 are our fabulous two-storey safari lodges with their own loo and shower. The glamping tents are each equipped with a fridge and camping stove and all set around a communal campfire, perfect for toasty evenings with family and new-found friends. The Geo Domes have their own outdoor hot tub and sun terrace. 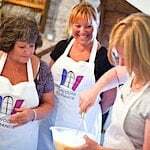 It’s great value for money too, with prices for three nights from under £200 for up to four people. You won’t find kid’s clubs and discos here – it’s all about the great outdoors. 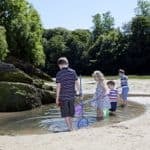 Facilities at Trevella include a heated outdoor pool, adventure playground, crazy golf (small extra charge), large fishing lakes and nature trails. We’re proud to have been awarded the David Bellamy Conservation Award for each of the last 15 years. 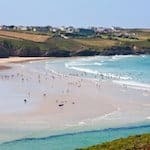 Trevella Park is a great base for exploring the north Cornwall coast, not least the spectacular Crantock Beach as well as cliff-top trails along the South West Coastal Path and the surfers’ paradise of Newquay. We’re pet friendly too – dogs are welcome in some of our accommodation. Find out more about Trevella Park and check our latest offers.